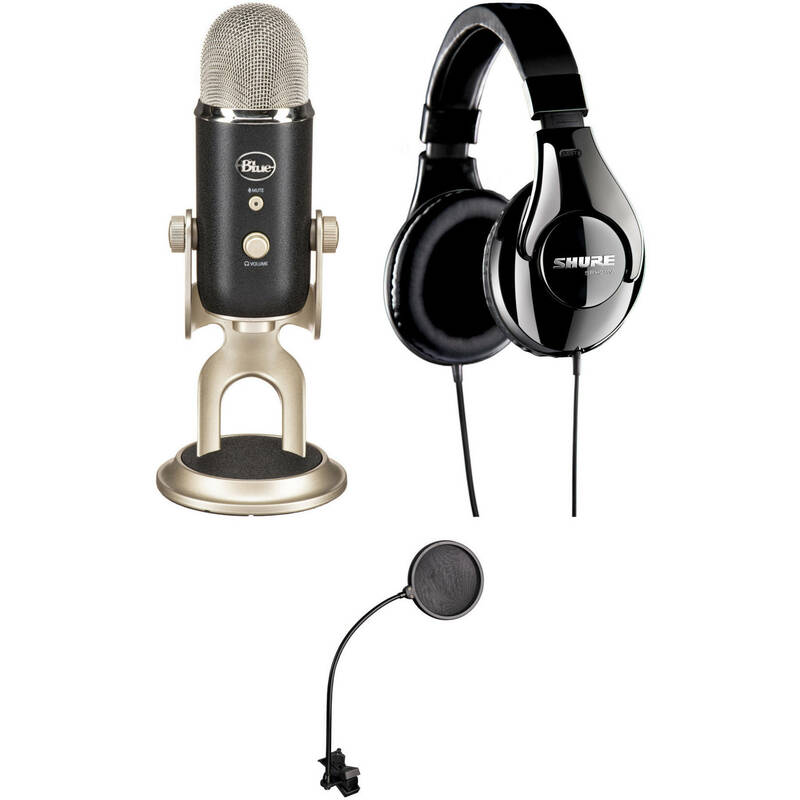 The Blue Yeti Pro Microphone Value Kit from B&H includes the Yeti Pro USB and XLR microphone, the Shure SRH240A professional around-ear stereo headphones, the Auray PFMR PFSS-55 nylon pop filter with gooseneck, a 9' USB cable, a 12" XLR Y-cable, and a custom microphone base. The kit can be used to capture 24-bit/192 kHz audio with Mac or Windows computers in broadcast, vocal, and instrument applications. The Yeti Pro USB & XLR Microphone from Blue is a versatile and flexible microphone designed to handle the gamut of recording tasks in studios, at home or in remote locations. The Yeti Pro features both XLR and USB outputs for use with standard analog microphone preamps, or direct integration with computer software (PC & Mac compatible). A professional A-D converter chip produces 24-bit, 192 kHz resolution. The Yeti's unique, tri-capsule array features cardioid, omnidirectional and figure 8 polar patterns. The Yeti Pro is also capable of capturing in stereo for recording ambiance, live performances, audio for sound design and more. The Yeti Pro delivers the feature set and flexibility well suited for vocal recordings, instrument capturing, sound design and more. The SRH240A Professional Around-Ear Stereo Headphones from Shure provide high-quality audio in a lightweight and comfortable design. Large 40mm neodymium dynamic drivers provide clear, detailed sound with a wide frequency response while the closed-back earcup design helps to block out ambient noise. The enhanced design features thick around-ear cushions and an adjustable headband that provide long-lasting comfort, allowing you to listen for hours without fatigue. The OFC cable provides plenty of slack and has a standard 3.5mm plug and a 1/4" adapter for wide compatibility with consumer and professional audio gear. The Auray PFSS-55 Pop Filter with Gooseneck features double-layered nylon to greatly reduce noise from aspirated plosives like "p" and "b" sounds. The PFSS-55's double-layered nylon filter gently disperses the explosive rush of air from speaking and breathing, while protecting your microphone from corrosive moisture. The flexible gooseneck makes it easy to position the filter exactly where you need it, the spring-loaded clamp provides fast and easy mounting and the locking bolt holds the PFSS-55 firmly into place. These features make the PFSS-55 Pop Filter ideal for desktops and also compatible with microphone stands. Box Dimensions (LxWxH) 9.9 x 6.3 x 4.9"
Box Dimensions (LxWxH) 9.5 x 8.7 x 4.6"
Box Dimensions (LxWxH) 14.3 x 6.8 x 2.3"